Michel Foucault’s The Birth of Biopolitics: Lectures at the College de France, 1978-1979 (Palgrave Macmillan, 2008) is prompting critics to reevaluate his intellectual and political project while offering new insights into the history of neo-liberalism. Our roundtable brought together a multi-disciplinary group of scholars to discuss new critical perspectives on Foucault’s lecture courses. What makes these lectures so relevant to us today? We discussed Foucault’s treatment of themes such as racism, war, ethics, and neoliberal subjectivity; reconsidered his critiques of Marx, Husserl, Weber, and others; and situated his analysis in the context of contemporary theorists of biopolitics, such as Giorgio Agamben and Donna Haraway. Finally, we asked, how might Foucault’s analysis of neoliberalism help us to form critiques of current political situations in the U.S. or internationally? This lively conversation with faculty from the Foucault Society’s 2008-09 Seminar Series on The Birth of Biopolitics was followed by a dessert reception sponsored by the Department of Philosophy, Stony Brook University. 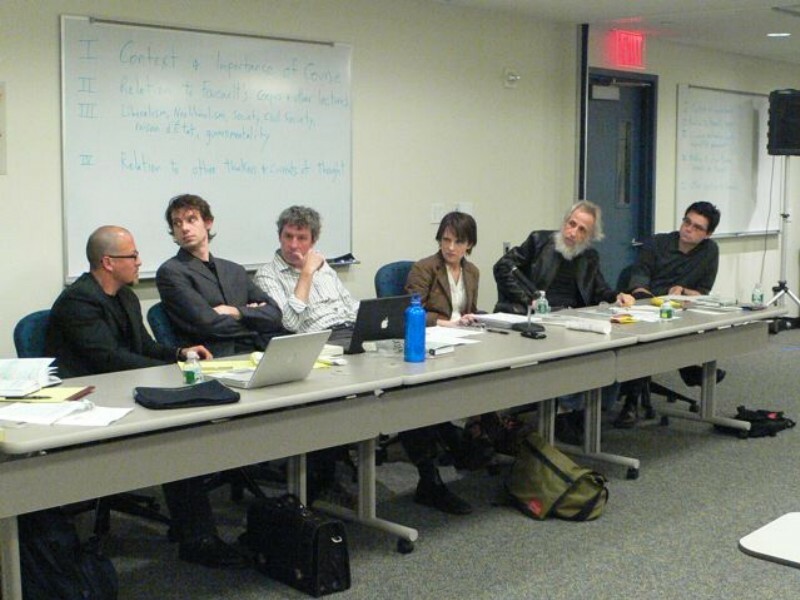 The 2008-09 Seminar Series was funded by a mini-grant from the New York Council for the Humanities. This event was open to the public. Copies of The Birth of Biopolitics were available for purchase at our discounted price: $21.00 (includes tax-deductible donation to the Foucault Society). About the Foucault Society: The Foucault Society is an independent, non-profit educational organization offering a variety of forums dedicated to critical study of the ideas of Michel Foucault (1926-1984) within a contemporary context. The Foucault Society is a 501 (c) (3) recognized public charity. As such donations are tax deductible under section 170 of the Internal Revenue Code.